James Conner’s rapid ascent, the fallout of Le’Veon Bell, and JuJu Smith-Schuster’s sophomore leap have tied Pittsburgh Steelers storylines to the offensive side the ball for most of the 2018 season, which has left the team’s highest-graded defender and budding superstar, Javon Hargrave, to go unnoticed. Hargrave earned a 90.3 overall grade in Weeks 6-11 (five games), which ranks fifth among the 109 interior defensive linemen with 100-plus defensive snaps in the six-week span. The third-year South Carolina State product, due in large part to his improvement in the Steelers’ last five games, now ranks 12th in overall grade (82.9) and 14th in run-defense grade (82.2) on the year. Listed at 6-foot-2, 305 pounds, Hargrave is a bit undersized if compared to traditional, run-stopping defensive interiors, but what was undersized has become the norm for the position in the NFL. Joining the likes of Aaron Donald, Geno Atkins, Mike Daniels and Grady Jarrett among others, Hargrave is a smaller, athletic defensive interior capable of winning one-on-one blocks in the trenches with quickness and explosive get-offs – not the space-eating 330-pounder of year’s past. In the play above, Hargrave beats Jacksonville Jaguars guard Chris Reed quickly off the snap and sacks quarterback Blake Bortles before the play even develops, as he fakes the inside move with a quick inside step to set up an easy outside swim of the reaching Reed. It’s moves like these that have Hargrave beating his previous career-high of three sacks only 10 games into the 2018 season. He’s also won 15.3% of his 72 pass-rush snaps in Weeks 7-11, ranking ninth among qualifiers. Oddly enough, Hargrave is even better against the run. His 87.7 run-defense grade in the aforementioned six-week span ranks sixth among all defensive interiors with 50-plus run-defense snaps. He has just eight defensive stops in Weeks 7-11, but his improved ability to win one-on-one blocks and force opposing backs to pivot their original point of attack can’t be overstated. 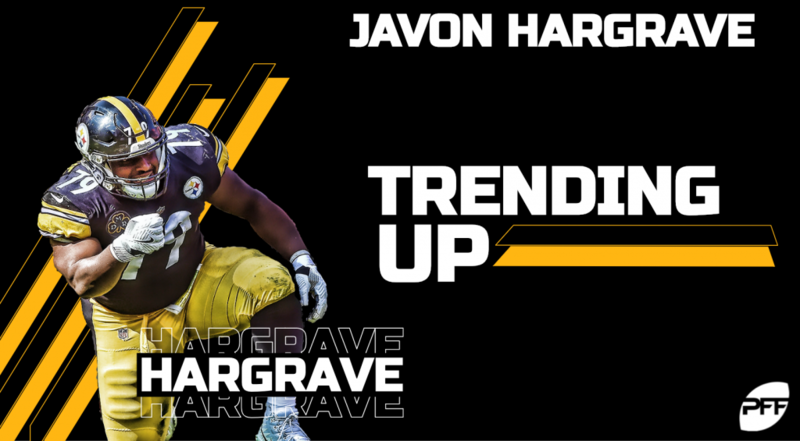 Totaling six total pressures and eight defensive stops in just his last two games, Hargrave is seemingly hitting his stride with the Steelers and could very well finish the year as one of the NFL’s best at the position.